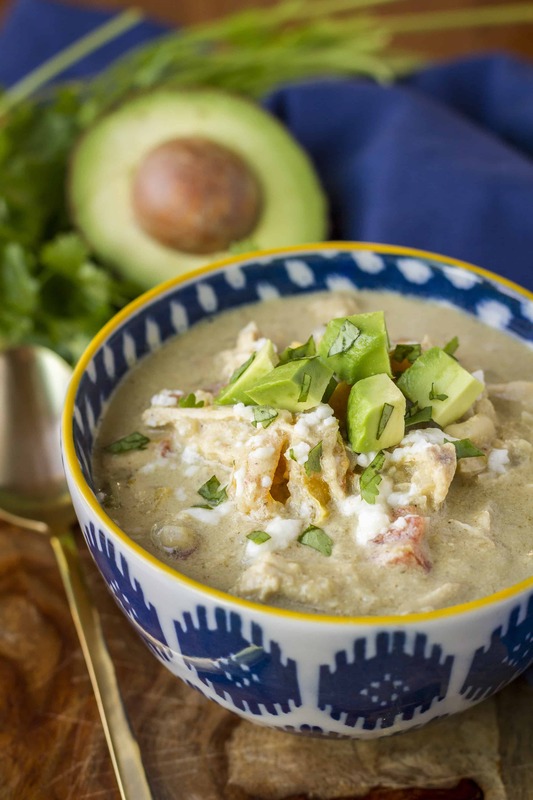 This delicious low carb creamy verde chicken chili is packed with flavor, yet has only one net carb per serving… Make it in your slow cooker or your Instant Pot for dinner tonight! 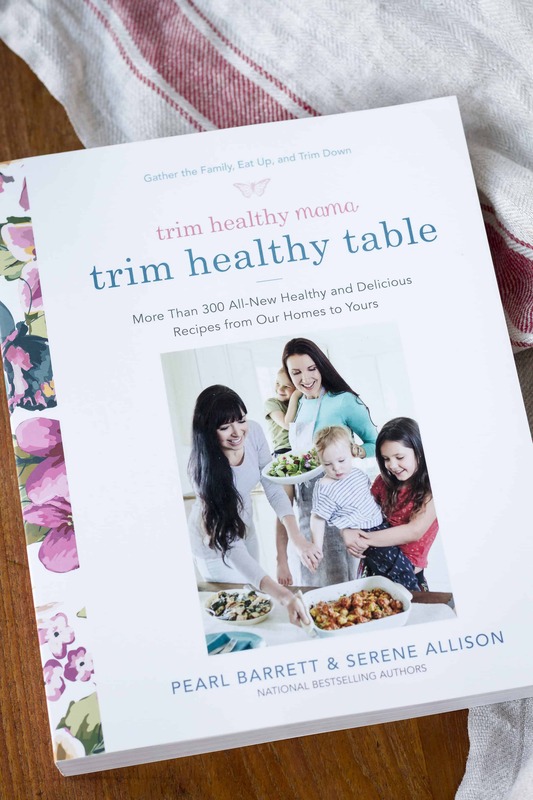 However, I’m totally making room on my shelf for this new Trim Healthy Mama cookbook, Trim Healthy Table! 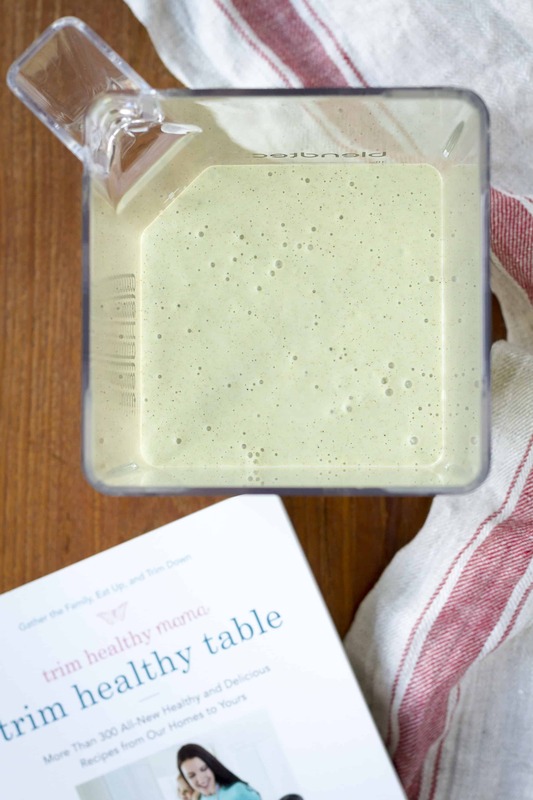 I’d heard about the Trim Healthy Mama eating plan (founded by sisters Pearl Barrett and Serene Allison) in passing before receiving the cookbook, but I’d never tried any of their recipes. Packed with over 300 recipes, this cookbook has a LOT to choose from. I like that the book opens with a quick overview of the Trim Healthy Plan. The Simple Start Guide introduces you to the basic concepts, which are all pretty commonsense: keep your blood sugar stable, be aware of fats and carbs, and protein is crucial. The recipes are heavy on the veggies, even sneaking them in, in some unusual and creative ways. And I appreciate their emphasis on learning to cook healthy and eating together as a family. 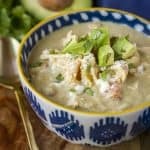 We tried the Creamy Verde Chicken Chili recipe last night, and I was honestly surprised by how much my kids loved it. Of course, I didn’t mention to them that there are not one, but TWO, secret veggies hidden inside: pureed okra (which helps to regulate blood sugar) and riced cauliflower. Pearl promises in the recipe intro that they’re completely undetectable, and they really were! This recipe can be made in either the slow cooker or the Instant Pot. Though I was a little worried about the cream cheese in the recipe, I chose the Instant Pot route. Using natural pressure release is essential to avoid venting the chili along with the pressure when it’s done cooking. Simply turn the Instant Pot off when the pressure cycle is complete, and let the pressure release on its own, which takes about 30 minutes. 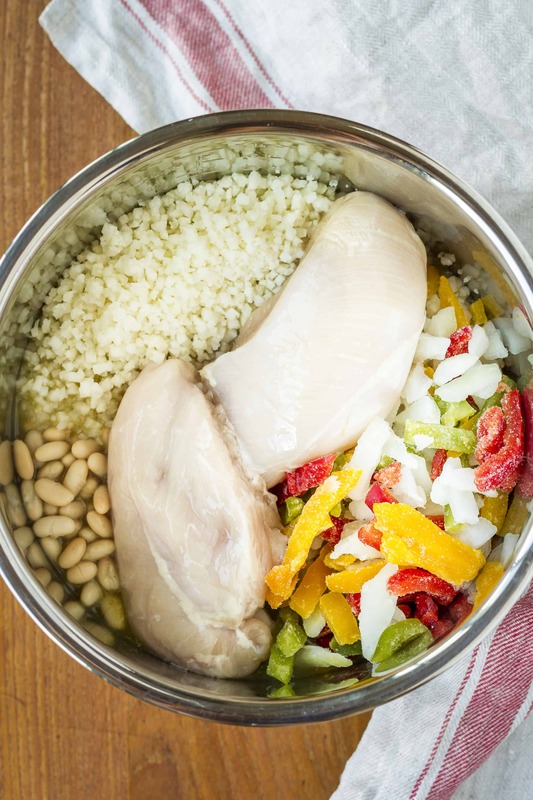 Start by placing the chicken, salsa verde, beans, Ro-tel-style tomatoes, riced cauliflower, and diced onions and peppers in the bottom of your crockpot or Instant Pot insert. Add the cream cheese, okra, 2 cups of chicken broth, salt and spice to the blend, and puree until there are no green specks left. Dump them into the pot, along with the remaining cup of chicken broth, and cook according to the instructions. When the chicken chili is done cooking, you just need to shred the chicken and serve. They mention doing this right in the pot, but I have no idea how to effectively accomplish this with all of the liquid sloshing around. I opted to remove them from the pot, shred them on my cutting board, and then add the shredded chicken back to the pot. This meant that I had one more thing to wash, but it just seemed easier and more logical. The recipe recommends garnishing with shredded cheese, diced avocado, or corn chips. I went with queso fresco and diced avocado, along with some fresh chopped cilantro, just because I love that bit of brightness it adds to dishes like this. 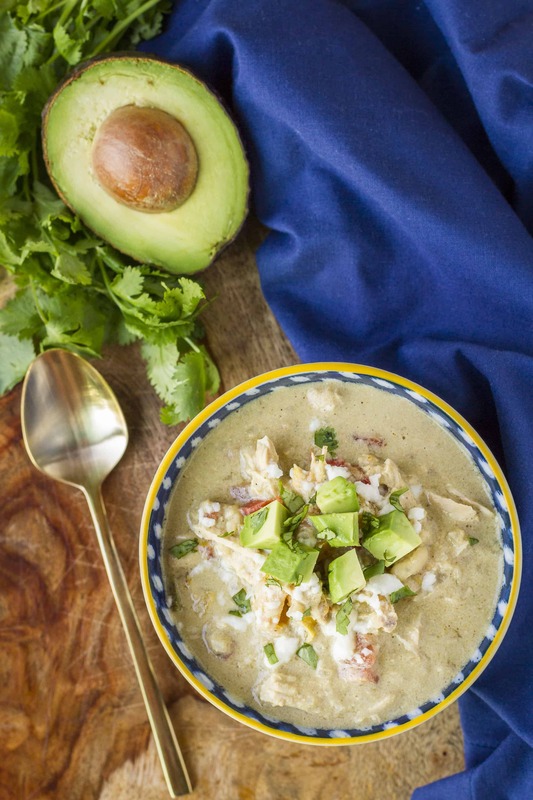 You should be aware that this Creamy Verde Chicken Chili recipe makes a TON. Both Pearl and Serene have large families, so the recipes in Trim Healthy Table are designed to serve 6 to 8. This is great for me, because we almost never have leftovers with the average recipe. But for smaller families, the recipes can be easily halved, or you can make the full amount and freeze half for later. However, I’m excited that I get to have another bowl for lunch today! This delicious low carb verde chicken chili is packed with flavor, yet has only one net carb per serving… Make it in your slow cooker or your Instant Pot for dinner tonight! Slow Cooker directions: Place the chicken, salsa verde, beans, canned tomatoes, cauliflower rice, and onion & peppers blend in the bottom of a crockpot. Put the cream cheese, okra, 2 cups of the broth, the salt, cumin, chili powder, onion powder, and garlic powder in a blender and blend until smooth. Add the contents of the blender to the crockpot, along with the remaining 1 cup of broth and stir. Cover and cook on low for 6 to 8 hours. When done, shred the chicken with 2 forks right inside the pot. Instant Pot directions: Add everything to the Instant Pot insert, including the blended sauce and remaining cup of broth. Seal and cook at high pressure for 25 minutes. Use natural pressure release. Shred the chicken. Reprinted from Trim Healthy Mama; Trim Healthy Table. Copyright ©2017 by Pearl P. Barrett and Serene C. Allison. Published by Harmony Books, an imprint of the Crown Publishing Group, a division of Penguin Random House LLC. Share your kitchen adventures with me on Instagram by tagging @unsophisticook and hashtag it with #unsophisticook to get featured in our community cookbook! 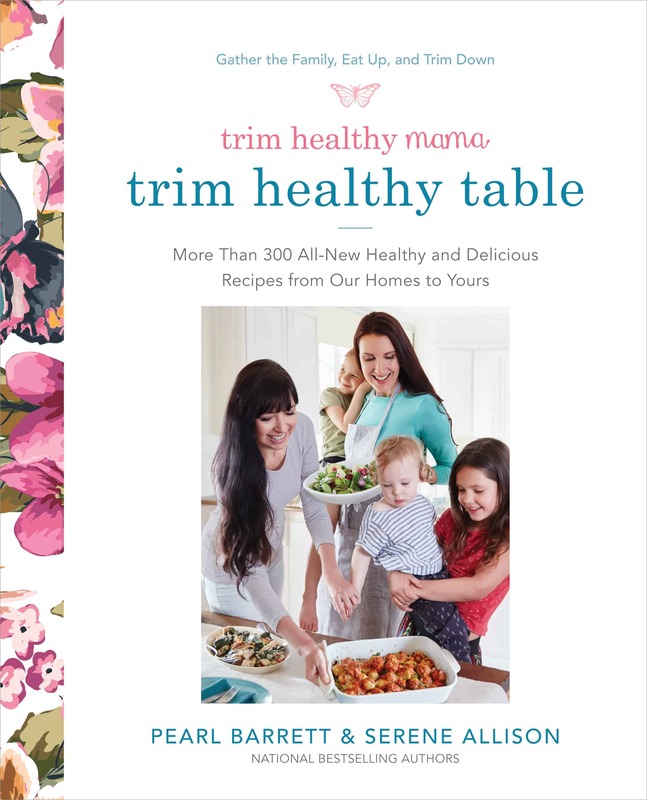 Trim Healthy Mama’s Trim Healthy Table is available in stores and at online retailers now. Follow the Trim Healthy Mamas on Facebook, Pinterest, and Twitter. Check out their Podcast and YouTube channel for more Trim Healthy content! Second time making this recipe and making extra because I made all my coworkers jealous!! Little do they know it’s low carb and healthy! Would love to see more recipes like this! This may be a silly question but 1 1/2 (8oz cream cheese) are we saying 12 ounces cream cheese? Wanting to make sure I’m understanding that right. Not silly at all! Yes, it’s 12 ounces — although I actually only used 8 ounces when I made it and it was pretty creamy as it was. I agree that it’s kind of awkwardly written. I copied it directly from the cookbook, but I think I’ll edit it to make it more clear. Thanks! I am always on the look out for healthy, tasty recipes. I hope to have a kidney transplant soon and want to change our eating habits for the better. I am trying to lose weight after baby. I’m always looking for new, healthy recipes and this chili looks divine. If the other recipes are anything like this one, I know I’d love to have this cookbook. I’m pinning it…the okra and cauliflower ingredients were a pleasant surprise! I want to win because of her obvious unique ingredients..unexpected. A good way to sneak in vegetables if you have picky eaters. And, I am a foodie who loves to cook and I do everyday. I’m always looking for new recipes..and a way to maintain my healthy weight status. I would love to use the cookbook to cook in my new home. I love learning new recipes. I love trying new recipes. My daughters are in college and they both love to cook. It would be a great way to help them. I love getting new recipes that are tried and true.Being low carb is bonus. I’ve read about THM plan but haven’t tried it personally. This soup sounds like a great item to add to my winter menu lineup. I’d love to see the other recipes included in the cookbook. This looks great for the cool days coming soon! Thanks for the giveaway. Would love to try some of their recipes. I need more expertise in healthy seasoning to bring more taste and flavor to my meals. I'm Tara: mom of 5 reasonably well-adjusted humans (well, 6 if you count my kid-at-heart husband) and one 80-lb. Weimaraner, who fancies herself a lap dog. Born and raised in Ohio (GO BUCKS!!! ), my fave things include cooking + baking (obvs! ), my JEEP Rubicon, the 4x4 beaches at OBX, and checking out the local craft beer scene... Learn more. get exclusive content straight to your inbox. Many links on this website are affiliate links, meaning if you click through my link and make a purchase, I receive a small commission for referring you (at no extra cost to you). Unsophisticook is a participant in the Amazon Services LLC Associates Program, an affiliate advertising program designed to provide a means for us to earn fees by linking to Amazon.com.